My new book, The Smart Girl’s Guide to Getting What You Want, has received a great review from Publishers Weekly, the bible of the American publishing and bookselling business, which calls the book an “empowering tome”. You can read the full review at Publishers Weekly and the book can be pre-ordered in print or ebook formats at Barnes & Noble, Amazon.com and Amazon.co.uk. 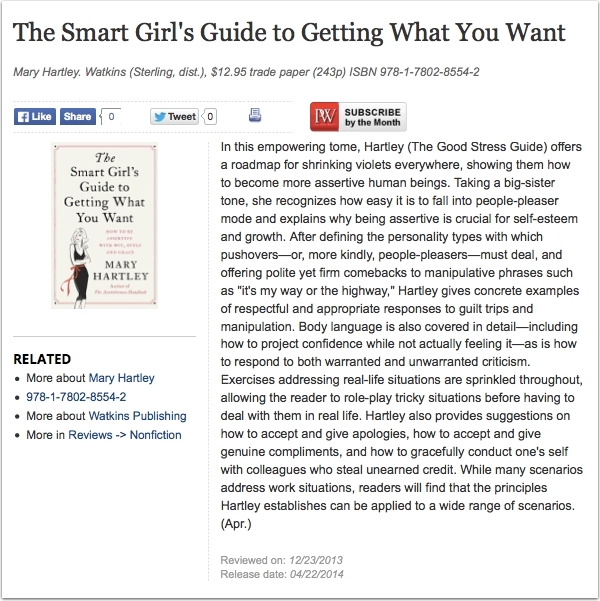 The Smart Girl’s Guide to Getting What You Want explains how to be assertive with wit, style and grace and will be published in April in the US and UK by Osprey Publishing and Watkins Publishing.